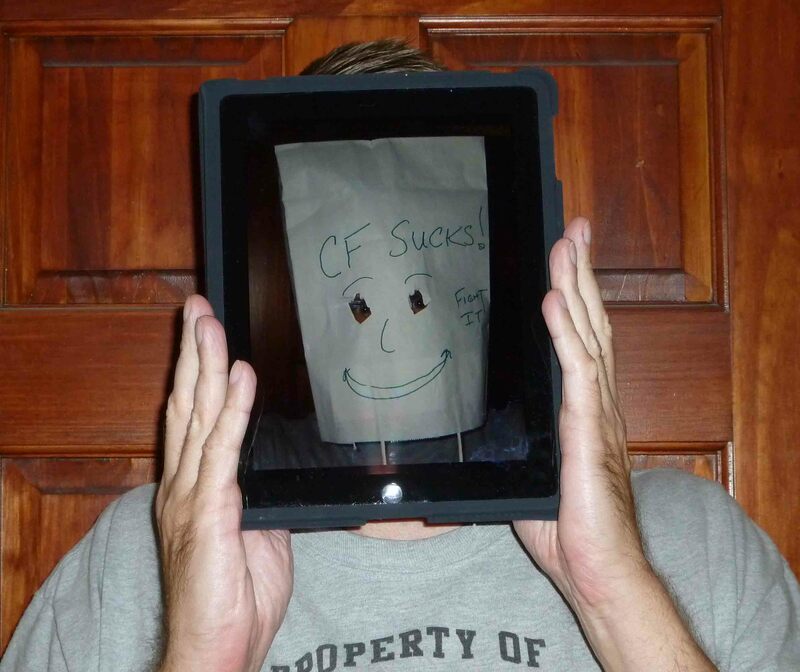 After three months of torturing myself about whether to buy an iPad – tweeting my agony to my friends – I purchased one. And it’s better than I ever expected. It’s a game changer when it comes to how we use computers. The iPad transforms the Internet experience into a book you hold in your hands while sitting in your most comfortable easy chair, or on the couch, or outdoors at night in a hammock. Its ergonomics when reading Internet articles and digital books blow away a laptop’s weight, size and physical design. Then there is the bonus of all bonuses for me: reading digital books. I don’t like the feel of rough paper e.g. grocery bags. If I were a captured spy, wrap me in a few Von’s paper grocery bags and all the Agency’s secrets will be spilled. I’ll talk, just don’t rub that paper bag on my chest again. I have never liked the feel of book paper either, or holding a book and trying to get comfortable with it for a long period of time. Reading books on the iPad is my dream. I can read an iPad one-handed by propping it against something. I can read while eating without pages flipping over. I can read while using two hands to do my flutter. I love the (almost) hands-free reading. 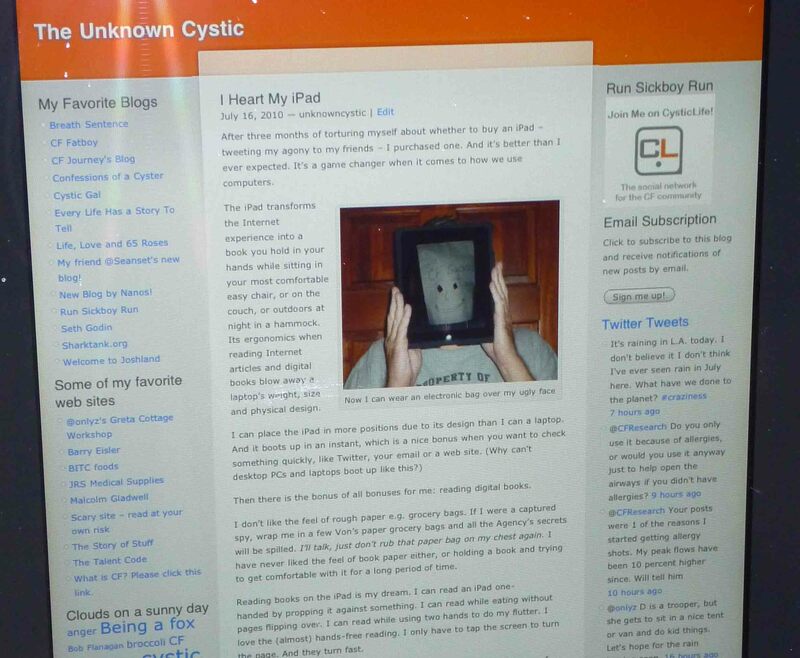 I only have to tap the screen to turn the page. And they turn fast. When I go to jail next time, my iPad will make the terrible experience of being locked up better. I won’t have to sit in a crappy hospital chair with my knees hitting the bed’s framework, my laptop sitting on the bed. I will be able to kick back on the crappy plastic bed and tweet and read blogs and books, and watch movies streamed from Netflix – all with one device – awesome. I waited three months to buy an iPad because I wanted to teach my daughter a lesson about not getting caught up in the hype of being the first to own new gadgets. (Now the lesson is to wait at least three months before getting caught up in the hype.) However, I did research it and talk to friends before buying it. And with those conversations in mind and some hands-on time with it, I knew my daughter and I would get a lot of use out of it for a long time. I did resort to using the “Life is short because I have CF” excuse to help make the decision – just a tiny bit. Other than fingerprints, which are annoying, my daughter stealing it and some software quirks, there is little downside. I expect that one day in the future, my daughter will leave for school, but she won’t have a backpack full of heavy books hanging from her shoulders. She will have an iPad or other tablet computer in her hand. And it will contain all of her school books, notes, dreams, pictures of her parents, dogs and friends. And every book she has ever read. I’ll stand by the door watching her skip down the walkway, love in my heart, thankful there won’t be chiropractor bills coming in a few years from her lugging 50 pounds of books each day. How nice that will be. And I’ll watch as the happy trees shake their leaves and wave and say to her, thank you, little girl, thank you. Have a great day at school with your paperless device thingy. What a wonderful world it will be. 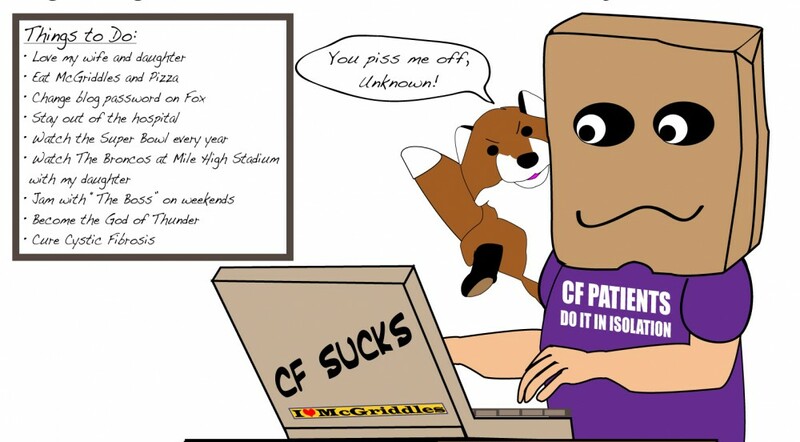 This entry was posted in cystic fibrosis, iPad, Technology and tagged Fun, Hospital stays, iPad by unknowncystic. Bookmark the permalink. I think the day that children use an ipad or something similar for school will be sooner than we think, probably before your daughter leaves school? Back in the days of our youth it took all day to programme a crappy home computer to produce a firework effect that lasted all of 3 seconds, but it was like magic for us. If someone all those years ago had said that I would be using a computer or mobile phone to speak to people thousands of miles away and get instant replies i would have fallen over wetting myself with laughter! Great comment. Very funny. You’re right about the future. I think you should write your own Saturday Funhouse. I just wrote one for you. Let’s call it even with the photo you took in the sunglasses. Maybe not. Your turn to write one. And I am TOTALLY pulling the CF card and needing this gizmo for my hospital stays! Finding a plug for the laptop that is near enough to the bed so that I’m not half in and half out just to type is a royal pain. I have a dumb question (you can tell I haven’t read much about it) — how does it get power? Do you charge it overnight? Please consider my advanced age when you snicker at my question. The iPad has a wall plug, but the battery lasts around 10 hours, so I only charge it overnight or every couple of days. Apple also makes a longer power supply, 10ft?, that you can use so you don’t drain the battery. I would never snicker at your questions. I’m not far behind you on the middle age train. I too struggled with purchasing my iPad. I did what seems like hundreds of google searches trying to find the best device. There are not too many choices at this point and none of them really compete with what the iPod has to offer. I’ve heard many critics complain that the iPad doesn’t have this or that, but it usually offers what they are talking about in the end. It just does it in a different, non-traditional way. Overall I’m happy and it sounds like you are too. I’m more than happy with my iPad. The longer I own it, the more I like it. The instant boot up is huge. So much to like. Thanks for reading and the comment. I appreciate it.